Happy Sunday all, MTN has done it again. They released another set of night data plans for their customers after releasing a night plan of 500MB for N25 few days ago. The newly introduced MTN night data plans are much more better than the earlier introduced night plans, reason is because, you are no longer going to wait for 12 midnight before you start using the newly introduced data plans, but this time the data plans starts from 9PM in the evening to stop by 6pm in the morning. That's awsome isn't it? They data plans offers you megabytes and Gigabytes much more than that of the previous which is 500MB for N25 Although the newly released night plans, their prices are higher than that of the previous. The New MTN Night Data Plans and their Prices are below, check for any one that suits you and subscribe. If you watch closely all the data plans listed above, they all have the same time duration but different capped data and prices. 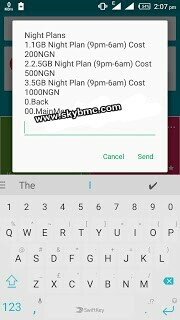 Now, How To Subscribe or Activate the MTN 1GB, 2.5GB, And 5GB Night Data Plan easily and fast, just follow the below simple step which involves dialing a used code. After recharging the amount of any above night plans, making sure the recharged airtime is up to the amount charged for the choice of data you are going for. Then proceed by dialing *198# after that, a pop up will display, then select 2 and next choose 8. And then finally, select the night plan which you recharged for. Bravo!!! You are there now, so that's it. Enjoy while it last. Note it works on all device including PC. Also can be shared to other phones through WiFi without any interruption. Download heavy files, musics, videos etc. Atleast bye to Netloop, and all VPN for now.